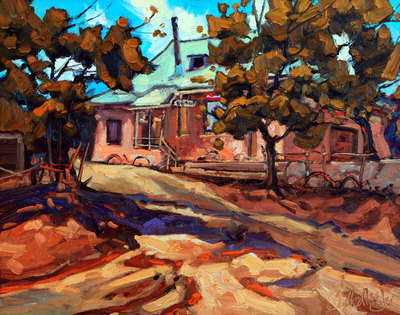 Dominik Modlinski, Toadlena Trading Post, Oil on Board, 11" x 14"
In America there are only a few places where the old west still feels alive and untouched by modern sensibilities. Nestled at the base of the eastern edge of the rugged Chuska Mountains in far western New Mexico lays one of these bastions of early western life, the Toadlena Trading Post. Founded in 1909, this charming structure built of native rock is one of the oldest active trading posts on the Navajo Reservation. Little has changed in this part of the reservation in over a hundred years. For many English is still a second language. Toadlena trading post is a place where local Dine (Navajo) meet, and trade for food and supplies. 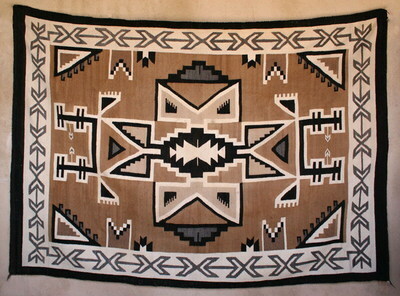 It is also home to some of the finest Navajo weavings produced today. Like its close neighbor Two Grey Hills Trading, Toadlena is famous for producing great weavings in a natural brown, black and white style. On any given afternoon, weavers from the surrounding area bring in their exquisite natural weavings to sell to the post. Navajo Two Grey Hills Rug by Mattie Nakii Tsosi, circa 1940, 93.5" x 65.5"
The Master Weavers, a new book that was 23 years in the making, is dedicated to the Toadlena weavers and their long weaving tradition. Written by Toadlena's trading post proprietor Mark Winter, it's the most comprehensive book on this important textile producing area and on Two Grey Hills weavings. The book is hefty and packed with history on the post and the weavers from the region. Six hundred pages long with 250 colored plates and 450 additional illustrations, the book tells the unique story of Toadlena, its rugs and the weavers who helped keep the store functional for generations of Navajos. Winter, a specialist in historic Navajo weavings, changed gears after he started running the trading post and went from dealing in older Navajo blankets and rugs to specializing in Two Grey Hills / Toadlena weavings, buying directly from local Dine weavers. Winter has encouraged the weavers to spin their own wool and to make larger more important weavings. To date he has purchased 5,400 new Two Grey Hill / Toadlena textiles during his 14 year career of owning the post. 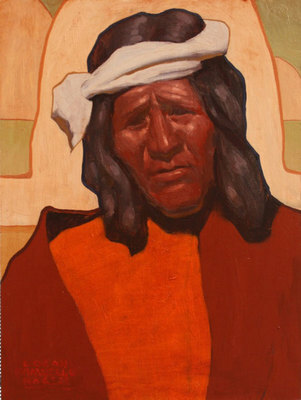 Logan Maxwell Hagege, Near Two Grey Hills, Oil on Linen, 16" x 12"
Toadlena: A Trading Post Visited opens at Tucson's Medicine Man Gallery on November 19th. It explores not only the Trading post as seen through Mark Winter's eyes (lecture/book signing) but also through a display of Navajo textiles both historic and contemporary all executed in the Two Grey Hills pattern. Medicine Man Gallery will display a large number of exceptional vintage Two Grey Hills/Toadlena weavings including one exceptional masterpiece by the famed weaver Daisy Taugelchee as well as a selection of contemporary weavings that Winter has collected over his tenure at the post. In addition to the antique and contemporary Navajo rugs, the exhibit will include paintings by two well-known artists Logan Maxwell Hagege and Dominik Modlinski. Both men have recently spent time exploring and painting the post and its people. The artist's style complement each other while celebrating different color palettes and interpretations of the land and people. Through their paintings one gets a sense of this unique setting, which is Toadlena. Hagege known for his imagery of Southwest native people relished the opportunity to visit a real active trading post and get the feeling of not only the landscape but to interact with the people though the hospitality of Mark Winter. Dominik Modlinski, The Watchers, Oil on Board, 14" x 11"
Dominik Modlinski, a landscape painter from Vancouver Canada, is experiencing the Southwest for the first time. Dominik has painted all over the world and has just returned from an extended trip to Africa. He is known for his bright colors reminiscent of Canada's Group of Seven. 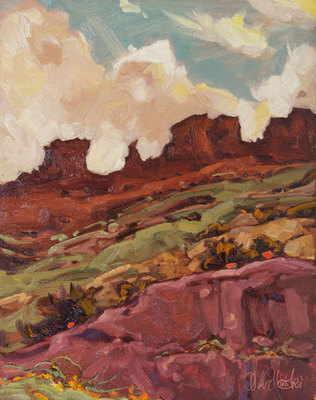 Modliniski spent over a month painting the Southwest focusing on the Navajo Nation specifically Toadlena. This will be Dominik's first United States art gallery opening and we are delighted he will be present the day of the opening. The show runs November 19th thru Jan 5th. Lecture and book signing by Mark Winter begins at 2pm, Saturday November 19th at Tucson's Medicine Man Gallery. For more information call 1-800-422-9382 or email us at art@medicinemangallery.com. View the entire Two Grey Hills collection online at www.medicinemangallery.com.